we all live in some sort of denial tif and i believe you are in mother denial...why you ask? because you are worrying about a cast when you most certainly will be better served to worry about the lovely, large, perfect-lashed, come hither eyes on your number 4...he will be a lady killer before long....making the cast issue seem like a walk in the park!!! (lol) and here you are going across the big water?? how wonderful! Prepare yourself for more of the same. I can see it in his (magnificent) eyes! Haha, he wins. Hope he feels better soon. So glad that dear son got properly attended to, but sorry you both had to wait so long. Now you know you're going to get 100 of these questions, but I have to ask, where is that Orla wallpaper in your Mossy Shed? We need more photos of it, pretty please. Sounds like your little guy has a good attitude on life. Hope he heals up soon. I love his attitude! What a great kid. The girls are gonna love him with those big eyes!! aw. tif he sounds lovely and making the best of life. they wont let you fly with a broken leg btw. we were grounded with the inlaws for 7 weeks with my poor 2yearolds break. What character, even with the cast. And any child that knows Monty Python by heart is ok in my book! Hope it heals soon. 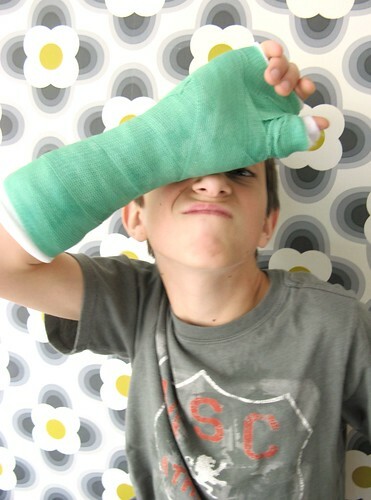 Coincidence that his cast nicely matches your decor? Haha aw, I'm glad he's looking on the bright side of things! :) It's a nice colour for a cast, at least! Very cute photos! and it seems like he likes getting his picture taken! What a positive vibe to have around, blessings! Our #4s, it seems, have amassed quite a glorious collection of broken parts, including mutually sympathetic footie injuries! My least favourite, I must admit, was the baseball that delivered a broken shnoz ... no fun, that one. I do hope that *your* #4 heals speedily and has a blast across the pond. He certainly sounds like an optimistic character! When are off to old blighty? I'm sure you have mentioned it...I've forgotten! well I must say, what a lovely colour! You have the loveliest blog. Talk of your wonderful ordinarily extraordinary blanket has reached these shores! It so appeals as I too favour 'less is more' crochet! 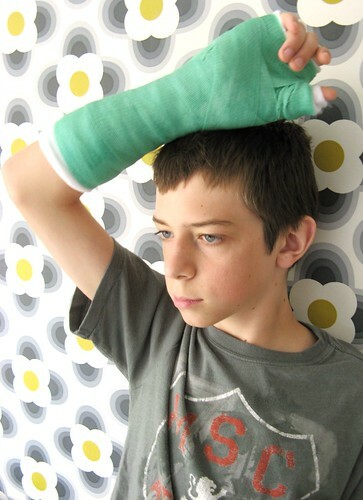 Warm wishes to your son - very fetching teal bandage! You're coming to Blighty? Please bring some sunshine! kind regards! wishing you well! Ha ha ha, what is it in the genitic makeup of boys that mean they can't help but pull faces as soon as a camera appears? as far as casts go, that is a very peachy shade of green. And what a mischeviously cute little urchin he looks to be. For a boy of his age, and considering the circumstances, he looks positively perky! And it is his right hand, I see. So who will feed him and dress him and comb his hair, poor little waif. haha! you see, a little bit of monty python is like a spoonful of medicine is it not! and sonja, the wallpaper is upstairs, here's a link to it. went up a year and a half ago. so you can see orla is still lurking in the shed. this one is lovely but i must say it would be a little too much for me if i had it downstairs! What a sweet boy, trying to cheer up his poor, frazzled mother! He reminds me of my number 3, who also cannot stand still and smile for the length of time it takes to press the shutter release. Oh, we have said those very words. 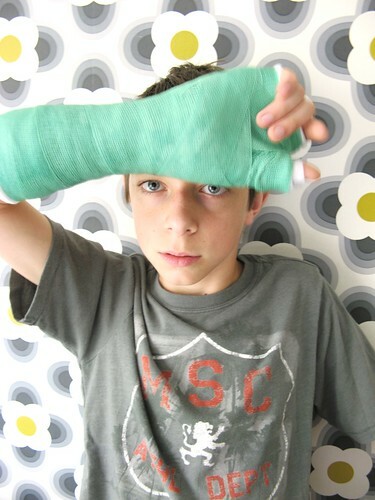 My second broke his arm the night before we were leaving urgently from Morocco to Spain because my pregnancy wasn't going well. At the time it seemed like nothing else could go wrong, so as we drove to Spain with broken arm all plastered, we all said what we were thankful for... including the fact that it was not his leg. Best wishes for a speedy healing!